The report Adult and Youth Literacy: National, Regional and Global Trends, 1985-2015 by the UNESCO Institute for Statistics (UIS) provides literacy data for 151 countries for the years since 1985. In addition to historical data, the UIS report contains projections for 2015, the target year of Education for All and the Millennium Development Goals. Regional trends in adult literacy were discussed previously on this site. This article takes a closer look at national trends in adult and youth literacy. Figures 1 and 2 present all national literacy data from the UIS database for the period 1985 to 2015 by region. Each line represents the data for one country. Single markers mean that only data for one year was available for a country. The first eight segments of each figure contain data for the countries within each region: Arab States, Central and Eastern Europe, Central Asia, East Asia and the Pacific, Latin America and the Caribbean, North America and Western Europe, South and West Asia, and sub-Saharan Africa. The "World" segment combines the data from all regions. In both figures, national trendlines are color coded according to the level of the earliest available literacy rate to facilitate distinguishing between individual countries and identifying the difference between the earliest and latest value for each country. A comparison of adult literacy rates (for the population aged 15 years and older) in Figure 1 and youth literacy rates (for the population aged 15 to 24 years) in Figure 2 shows that youth literacy rates are generally higher than adult literacy rates. This is a reflection of the fact that younger generations are typically more likely to be able to read and write than older generations, except as countries reach universal literacy, as in Central and Eastern Europe, Central Asia, and North America and Western Europe. The spread between the countries with the lowest and highest literacy rates is also smaller for youths than for adults. In South and West Asia, for example, the adult literacy rate is expected to range from 60% in Pakistan to 99% in the Maldives in 2015. By comparison, the youth literacy rate is expected to range from 77% in Pakistan to nearly 100% in the Maldives in the same year. 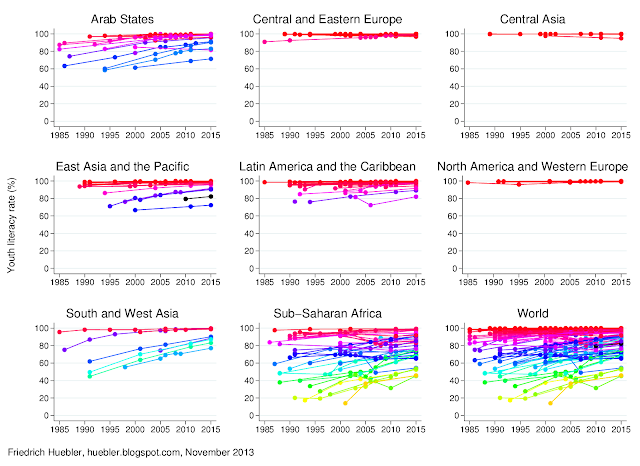 This increase in literacy rates over time can be observed in nearly all countries with data. Please consult the report published by the UIS for further analysis of adult and youth literacy. The statistical annex of the report contains all national adult and youth literacy rates shown in Figures 1 and 2. Note: National trendlines are color coded according to the earliest value for each country. Source: UNESCO Institute for Statistics (UIS). 2013. "Adult and Youth Literacy: National, Regional and Global Trends, 1985-2015". UIS information paper. Montreal: UIS. http://www.uis.unesco.org/Education/Documents/literacy-statistics-trends-1985-2015.pdf. UNESCO Institute for Statistics (UIS). 2013. 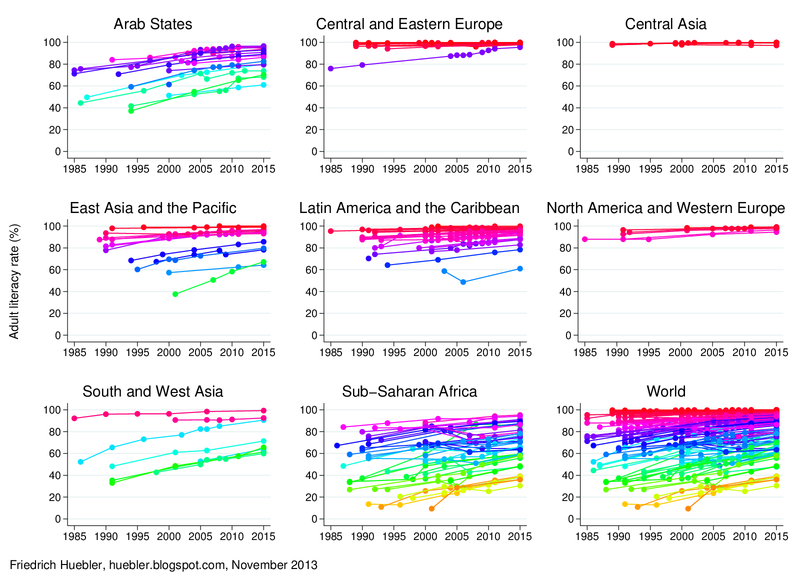 "Adult and Youth Literacy: National, Regional and Global Trends, 1985-2015". UIS information paper. Montreal: UIS. 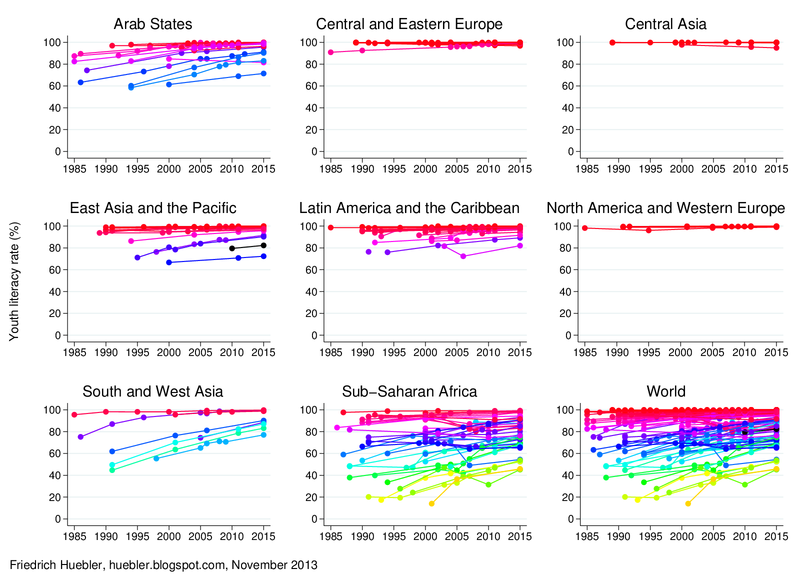 http://www.uis.unesco.org/Education/Documents/literacy-statistics-trends-1985-2015.pdf (940 KB).